After winning the Canadian Green Car Award at the Green Living Show in April and selected as the Automobile Journalists Association of Canada's (AJAC) 2018 Canadian Green Car of the Year in March, the Chevrolet Bolt, and Chevrolet in general, is a hot commodity in the electric vehicle industry. Beyond the awards however, it's Chevrolet's other plug-in option that is capturing the attention of consumers. The Chevrolet Volt ranks first in most auto insurance quotes requested by drivers seeking coverage for a plug-in from Kanetix.ca, with just over 18 per cent. The Tesla Model S is not far behind with 16 per cent of quotes requested. Rather than an internal combustion engine, BEVs are battery powered vehicles that run solely on an electric motor. To replace 'fuel,' BEV drivers recharge their battery by plugging into a wall socket or a charging station. According to PlungnDrive.ca, there are more than 4,500 charging stations across Canada. PHEVs, on the other hand, run primarily on electricity but still have a gas engine for backup, in case the vehicle runs out of charge. These vehicles can also be plugged into an outlet to recharge. 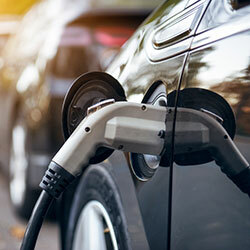 The market for electric cars in Canada is definitely there and at Kanetix.ca we can help you find the best insurance rate for your electric vehicle. Compare auto insurance quotes today to ensure you are getting the best price for your coverage.